Renkin San-kyuu Magical? Pokaan follows the daily lives of four young girls. There is just one catch: they are anything but normal. 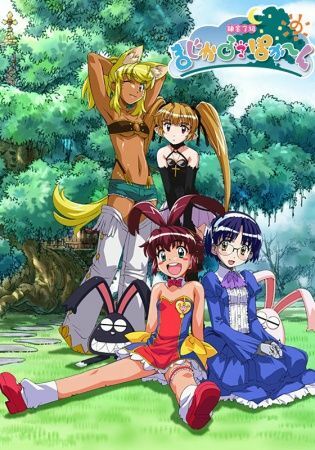 This group of friends—the energetic werewolf Liru, the joyful witch-in-training Uma, the motherly android Aiko, and the seductive vampire Pachira—are actually princesses from the netherworld who have traveled to the human world in search of a new home. Unfortunately, their naivety and severe lack of knowledge make living peacefully among earthlings much more difficult than they imagined. As they attempt to adapt to their brand new lifestyle, they cause all sorts of trouble, and end up attracting the unwanted attention of a woman by the name of Dr. K-Ko. The scientist believes that these new residents of Earth are up to no good and attempts to capture the girls to prove the existence of the supernatural and gain credibility with the scientific community. Every day brings a new adventure as the girls deal with the insanity of her antics and all that the human realm has to offer.